Remove the gills and entire contents of the body cavity. Take particular care to remove the dark blood associated with the kidneys running along the spine. Tossing your freshly caught fish into a plastic bin in the hot sun is a bad idea. Try to use an insulated bin with a tightly sealed lid and ice if you can to lower the temperature of the fish. For best results gut and gill your catch and place it on ice as quickly as possible. When you catch a fish the worst thing you can do is flick the hook out of its mouth and biff it on the deck, beach or river bank, where it stays until its time to go home. In hot weather fish deteriorates very quickly. You have to prepare your fish for the table starting the moment you remove it from the hook. This requires a bit of preparation. Ron Docherty, the weighmaster at the Rakaia Salmon Fishing Contest gave a warning one evening to contestants. Apparently some blokes had been bringing in fish for weighing that had been stored in black plastic refuge bags and kept “cooking” all day in the sun. Ron warned that some of these fish had an odor that would suggest eating them might result in repeat trips to the toilet, or worse. 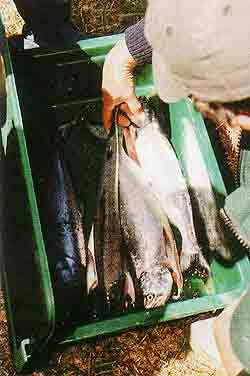 The traditional way of keeping a salmon while out fishing for another is to store it in a super phosphate sack. These were once made of Hessian. Nowadays this has given way to nylon. The old Hessian sack were excellent because they held a great deal of water and remain wet for a long time. Storing your fish in a sack works reasonably well provided the sack is kept in the shade, or better still is kept damp as well. In the jet boat a few balers of water over the sack every so often will make a big difference. Kill your fish immediately after capture. This is not only humane it may also enhance the flavour of the fish when eaten later. By far the best method of keeping your catch fresh is to drop it straight into a chilli bin the moment it is caught. Many sea anglers prefer an ice slurry (half water and half ice) in the chilli bin. The slurry wraps itself around the fish and chills it very quickly. This is particularly important with species such as albacore tuna which can go off very quickly if not iced down immediately. Perhaps a cleaner method, and the one that I prefer is to freeze three or four plastic two litre milk bottles filled with water. Leave a couple of inches for expansion at the top of the bottle when freezing. Take them out of the freezer and screw the lids back on before putting them in your chilli bin. The large two litre blocks of ice will remain frozen much longer than the small “ice bricks” sold with chilli bins. The plastic milk bottles are also disposable should they start to stink! At the end of the day if you don’t catch a fish you can put them back in the freezer. The more ice there is in the chilli bin relative to its volume the lower the temperature. I have found that with this method, provided you keep the lid closed, the ice will remain frozen for up to four days. This is excellent on a longer trip into the back country or for that extended surfcasting trip. A superphosphate sack allows air to circulate. Keep the sack wet and in the shade if possible. 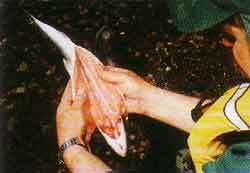 Fish will keep much longer if they are gutted and cleaned immediately after capture. Scrape the dark kidney blood from along the back bone as well. Kahawai in particular benefit tremendously from this treatment. Fish are a valuable commodity. Don’t waste your catch. Plan ahead so that you have the ice available.